Women may hold up half the sky, as per the Chinese proverb, and they account for half of all tech users, but they remain severely underrepresented in the worlds of technology and entrepreneurship. This is unsustainable and unacceptable. It harms technological development, holding back societal and economic progress. When airbags began to be introduced into cars the evidence quickly showed that women and children were injured disproportionately. The reason: they were designed by and tested on men. Today’s global tech industry is no better. Early speech recognition software struggled to recognise women’s voices. In 2014, Apple released a health app that could keep track of a wide-ranging set of health metrics – including blood-alcohol content - but which initially failed to account for menstruation. Despite being equal users of technology, women do not participate equally in its development. The tech industry is male-centric, and it is easy to see why. Only 5% of leadership positions in the technology industry are held by women. 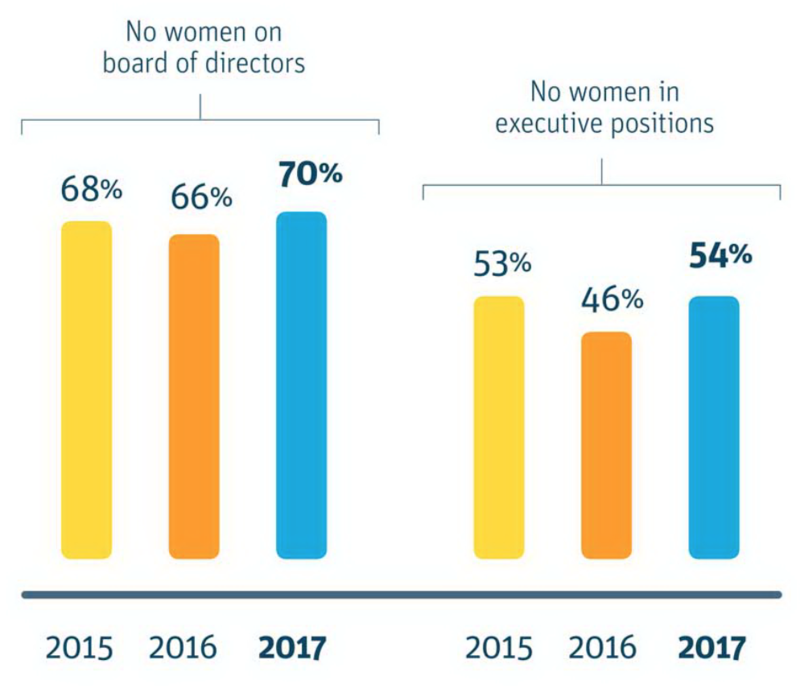 A recent report found that more than two thirds of US start-ups have no women at all on their board of directors. According to a new World Economic Forum report, the global gender gap will take 100 years to close at the current rate of change. Just as alarming is that countless life-changing innovations could be failing to reach the marketplace. There remains an embedded gender bias in the funding of start-ups. In the UK, men are 59% more likely to secure angel investment and 86% more likely to be VC-funded in digital start-ups than women. This reflects the imbalance in venture firms. According to one study, just eight percent of partners of the top 100 venture firms globally are women. ‘Tech bros’ have tried to claim that the lack of women in tech can be explained by innate biological differences. This is a plainly ridiculous claim. A climate of systematic bias, a cycle of men funding men, and a working culture that excludes women is at the heart of the problem. The evidence speaks to the sheer wastefulness of this situation. When women are given opportunity, they excel. Kauffman Foundation research shows that tech companies led by women achieve a 35% higher return on investment than firms led by men. Forbes found that women tech entrepreneurs, despite having received 50% less venture capital funding, produce 20% higher revenues than their male equivalent. A recent study by PwC and the Crowdfunding Institute showed that campaigns led by women across the world in 2015 and 2016 were 32% more successful than those led by men across a wide range of sectors, geography and cultures. Remove the bias of the institutional investor, listen to the crowd, and women thrive. So how can we encourage more women to reach that stage? There needs to be systematic and sustained efforts, from schools, to universities and workplaces, to encourage women into technology careers. This needs to start early. Research by PwC into over 2,000 school and university students shows the gender gap in technology starts at school and carries on through every stage of women’s lives. Girls are less likely to study STEM subjects at school, and this gap continues through to university. This leaky pipeline leads to a dearth of women pursuing tech careers. The problem is self-perpetuating. Over a quarter of women students say that they have been put off a career in technology because they view it as too male dominated. We urgently need talented women role models in tech to challenge this perception. Initiatives that show how technology as a force for good will also help. Fifty percent of women say that feeling like the work they do makes the world a better place is the most important factor when deciding their future careers. Businesses are supporting some positive developments in this area. Girls Who Code now support 40,000 women in the US, with support from AOL, Google, Microsoft and AT&T. PwC has created a new fully-funded technology degree apprenticeship in computer science aimed at getting more women interested in technology careers, where students are fully funded and guaranteed a job in the company. There is much that universities can do. Imperial College London’s entrepreneurship programme for women is one such example. WEInnovate, now in its fourth year, is designed to inspire a new generation of women entrepreneurs through structured mentoring, sessions with inspiring business leaders, and workshops to help participants harness skills in leadership, business, and pitching. Numerous businesses have grown from the programme. Christina Peterson has founded Lys – a wearable sensor that tracks exposure to light to help regulate circadian rhythms. Clementine Chambon’s Oorja provides electricity to off-grid communities in rural India by building mini power plants. Products that prioritise the needs and experiences of women flourish in this environment. Olivia Ahn’s company WithLula, is developing innovative sanitary towels and an associated cycle tracking app. Ana Luisa Neves’ company Momoby, is developing a revolutionary finger prick test for diseases with a known impact on pregnancy, that will bring prenatal care to pregnant women living in isolated areas in developing countries. Dr Natalie Shenker founded Hearts Milk Bank, a social enterprise that provides donor human milk to sick and premature babies. Business schools can also help, through scholarships and bursaries and having women teach entrepreneurship. Initiatives such as the Silicon Valley Greenhouse Project, based at Stanford University involves local entrepreneurs and aims at identifying and arming the highest potential thought leaders in Silicon Valley with the skills, training, research, access, and close-knit support to dramatically increase the influence of women. George Washington University has a number of programmes supporting women entrepreneurs, including the Hot Mommas Project of a large digital case library of female role models along with cutting edge teaching tools. Men working in tech and innovation have a duty to listen, engage, and encourage women in their sectors. There are many organisational arrangements that can be put in place around issues such as maternity leave, flexible working hours, and mentoring, to encourage women to work in tech careers. But broader cultural changes are also needed. Women’s contributions need to be respected, their voices have to be heard. Companies will be better places to work, and more innovative and productive, as a result. When women are unleashed on the tech world, new ways of living, of seeing the world and of doing business reveal themselves. But that needs more than just warm words. Today’s generation of tech leaders need to invest, create new opportunities and think critically about how to fundamentally change this culture.